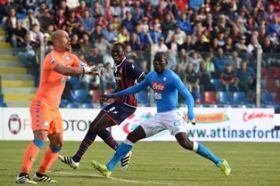 Nigerian striker Simeon Tochukwu Nwankwo was the hero of the night on Wednesday as Crotone held Serie A leaders Juventus to a 1-1 draw at the Studio Ezio Scida. The former Gil Vicente player cancelled out Alex Sandro's goal in the 16th minute with a spectacular volley in the 65th minute. It was a game in which Juve coach Massimiliano Allegri made some changes and was looking to record a 10th away win in the last 11 league outings for the Old Lady. The draw has somewhat helped the Serie A strugglers coached by former Italy goalkeeping hero Walter Zenga to ease their relegation fears. Nwankwo became the toast of his teammates, coaches and fans alike after the game as the home crowd sang the club's anthem. The goal was Nwankwo's third of the campaign, the second coming ten days earlier in a 1-0 home win at the expense of Bologna. The beanpole Nwankwo had not scored in 12 matches in the division before his previous effort. Napoli, Juventus' title rivals defeated Udinese 4-2 at home. Both giants will face off at Juventus Stadium this weekend.